President Kathryn Hill and Vice President James Rich. At their January 14, 2019, organizational meeting, the CCUSD Governing Board elected Ms. Kathryn Hill as president and Mr. James Rich as vice president. Kathryn graduated Phi Beta Kappa with a BA in Economics from the University of Oklahoma. James is a graduate of the Mesa Police Academy and the Constable for Desert Ridge Justice Precinct. He has a BA in Political Science and is a former Army Officer and veteran of ten years. 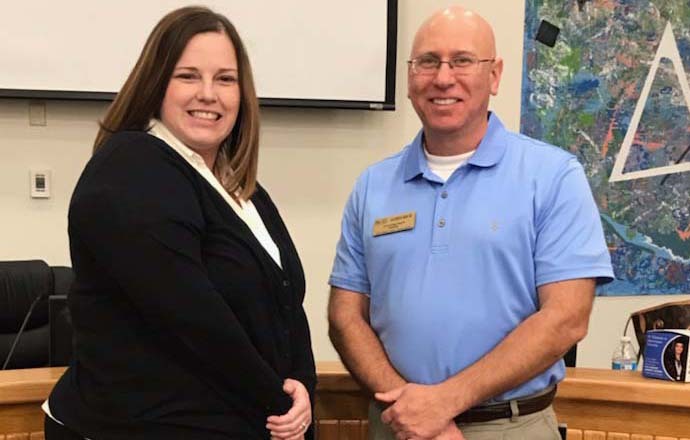 At that same meeting, the CCUSD Governing Board elected Ms. Beth Hatcher as their ASBA Delegate and Mr. Scott Brown as the ASBA Delegate – alternate. Beth attended Purdue University and obtained her Bachelor of Arts from Ottawa University. She also has a M.Ed. in Curriculum and Instruction from Arizona State University. Scott served as a Co-President for LMES PTO, was on the Rebuild the Nest Committee and served on Cactus Shadows’ Site Council. He is one of the founders of the Cave Creek/Carefree Youth Football & Cheerleading and is the Chairman of the Kiwanis Marketplace Committee. CCUSD Governing Board Meetings are held in the Governing Board room, located at CCUSD’s District Office (33016 N. 60th Street in Scottsdale). You can find a list of meeting dates for the 2018-19 fiscal year by going to CCUSD’s Website www.ccusd93.org.